Arrive at your next Nashville concert in style with Emerald Luxury Transportation concert limo services. 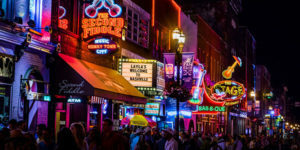 You and your group are getting ready to go to Nissan Stadium, Bridgestone Arena, Ryman Auditorium, or the Grand Ole Opry to see your favorite artist perform. As you look outside you see your luxurious limo from Emerald Luxury Transportation sitting in front of your home. Once inside the limousine, you hook up your iPod with your favorite music, and begin to enjoy your beverage of choice. By this point, you are relaxed, and in the mood to start singing with your favorite artist. Your chauffeur will pull up to the front door of your concert venue, drop you off, and return prior to the end of the concert. Why worry about the headaches of who is going to drive, where to park, how long you will have to walk, or warming up or cooling down your vehicle? Your chauffeured vehicle from Emerald Luxury Transportation will make your concert limousine service an evening to remember. We offer complimentary Red Carpet Service. Are you ready to reserve your Nashville Concert limousine service? Our friendly Nashville Concert Limo Reservationists are available 24 hours a day, seven days a week, and 365 days a year at 615.678.4695 or 855.436.4902. We will do everything in our power to ensure your transportation is smooth, and your experience is as seamless as possible.